sound experience and is RIM's top-of-the-range model. Featuring accurate sound reproduction via noise-isolating ear gels, the headset provides clear communication while taking calls and enhanced sound quality when listening to music or watching videos. 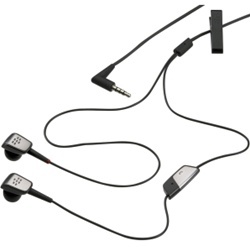 A hands-free in-line microphone design blends seamlessly with the headset and is uniquely positioned to enhance the sound of your voice while talking on the phone. Switch readily between chatting on the phone and listening to your music library via an easy-to-use control button. With it, you can answer, end, or mute phone calls and pause or play music, all with a single touch.